Rhinoplasty, “a nose job”, is one of the most powerful operations in plastic surgery to help create harmony among your facial features. A disproportionate nose not only affects your profile but also can make your face look too narrow or too wide. During a rhinoplasty, the nose is reshaped by tailoring cartilage and boney structures to refine your overall appearance and improve self-confidence. A rhinoplasty procedure modifies the width of the bridge of your nose, improves your profile by augmenting depressions and reducing humps, narrows wide nostrils, corrects deviation, and refines the contours of your nasal tip. It can be reconstructive due to an injury or birth defect, functional to improve breathing, cosmetic or a combination. Combining nasal reshaping with septoplasty for a deviated septum or with turbinate surgery can improve breathing. The goal of the procedure is to have an improved, more balanced natural appearance while correcting internal structural deformities which may have led to breathing difficulties. Can One Nose Fit All? Historically, surgeons have performed more radical rhinoplasty procedures removing large parts of cartilage. The result was a small, “cute” nose lacking support and structure with a pinched, ski-sloped tip. Often every patient was given the same nose. Noses became the trademarks of the surgeons who transformed them. 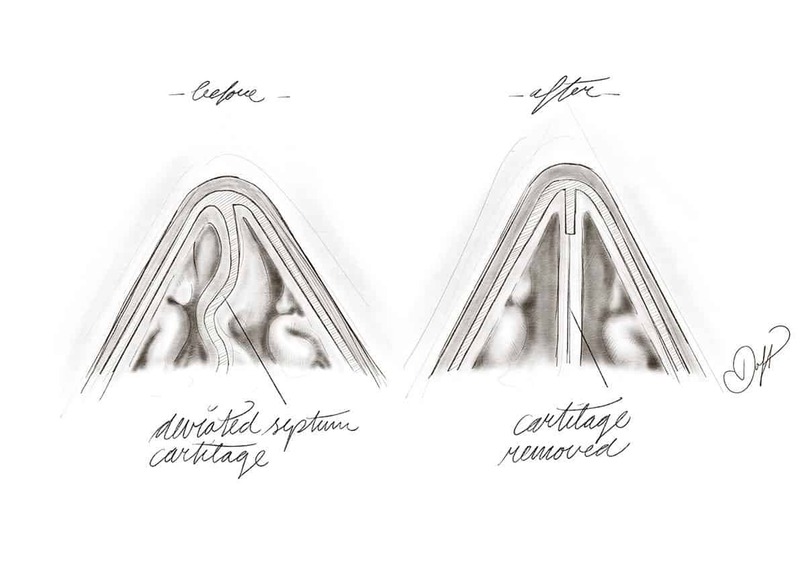 The new era of rhinoplasty surgery focuses on removing millimeters of cartilage while maintaining structural support and often improving breathing. 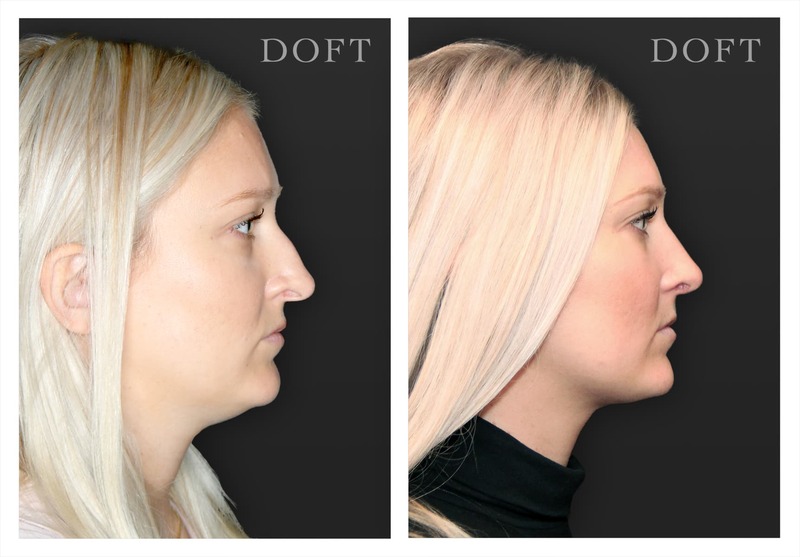 My goal is to never have a “Doft” nose, but instead to tailor your existing nose so that it balances your face. When a patient presents to my office, they are usually looking for a change. For certain operations, they may seek a significant transformation as in a breast reduction or liposuction. Patients who present for a rhinoplasty seek a subtle change. They often want the hump removed, the tip refined, or the nostrils smaller but they never want a “nose-job” look. Rhinoplasty is an operation of subtleties where adding a stitch or removing a millimeter is able to transform a profile. 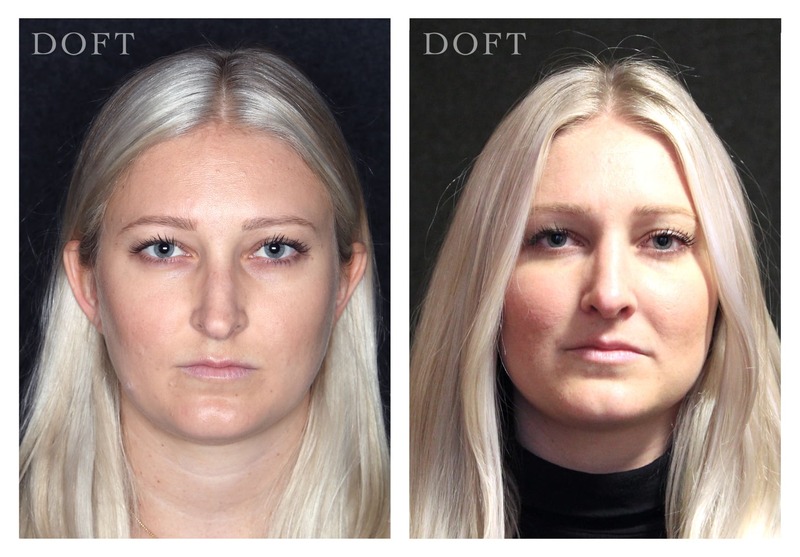 My favorite response after removing a nasal splint is when a patient exclaims, “This is the nose that I was meant to be born with!” The most successful rhinoplasty operations occur when your nose does not draw attention to itself but instead complements your other facial features. Unlike other cosmetic procedures, the nose offers an additional challenge in that it must function. It is essential to balance making the nose smaller and more defined with ensuring open nasal passages. Many patients seek rhinoplasty for purely functional needs, explaining that they have trouble breathing. This may be due to a deviated or twisted septum, abnormal anatomy, previous surgery or a fractured nasal bone. 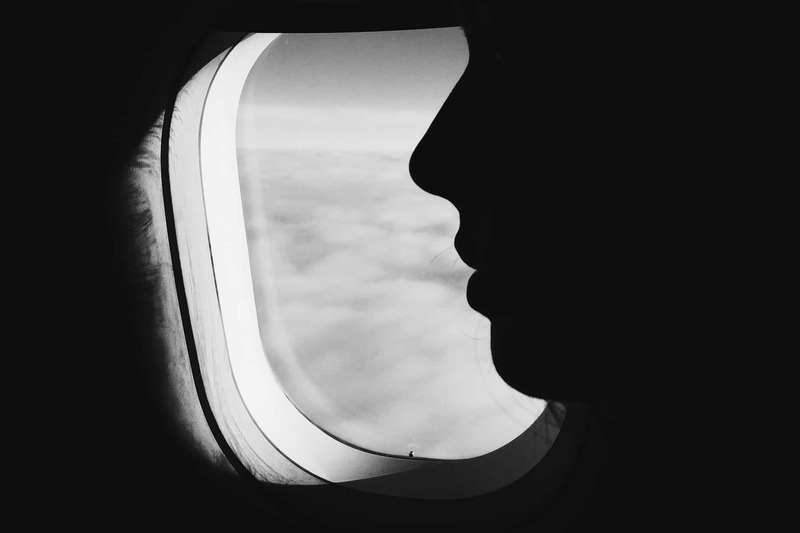 There are special techniques which can be performed to help preserve and optimize breathing at the time of rhinoplasty. The most common cause of breathing problems is a deviated septum which narrows the airflow of the nostril on one or both sides. A septoplasty is a procedure in which the curved part of the septum is removed leaving a sufficient portion of the septum intact to allow for nasal support. Sometimes, the nasal passage is hindered by large turbinates, structures on the inside of your nostrils. Turbinates may be pushed outward to increase airflow. Breathing can be restricted in the middle third of your nose as well due to a tight internal nasal valve. Spreader grafts are often used to widen this area and to straighten your nose. Alar grafting is used to support the external valve. The external valve of the nose is the opening of the nostril. In some patients, it collapses when they breathe in. Depending on your symptoms, correcting functional complaints may be considered medically necessary and covered by your insurance plan. The most common cause for breathing problems is a deviated septum in which the curved septum prevents nostril airflow. A septoplasty is a procedure in which the curved part of the septum is removed, leaving a significant portion of the septum intact to allow for nasal support. The procedure is performed as an out-patient procedure either in an operating room suite or the hospital. The surgery will take approximately two hours. It is important that a patient has completed their facial growth prior to having rhinoplasty for cosmetic reasons. The procedure is either performed using an open technique in which a small incision is hidden under the nose in the columella, the column of tissue between your nostrils, or through a closed technique where the incisions are concealed inside your nostrils. Deciding which technique to use depends on your particular surgical needs. There is a clear advantage to performing an open rhinoplasty for patients whose main concern is their tip. During an open technique, the tip skin is lifted to expose the entire internal framework. 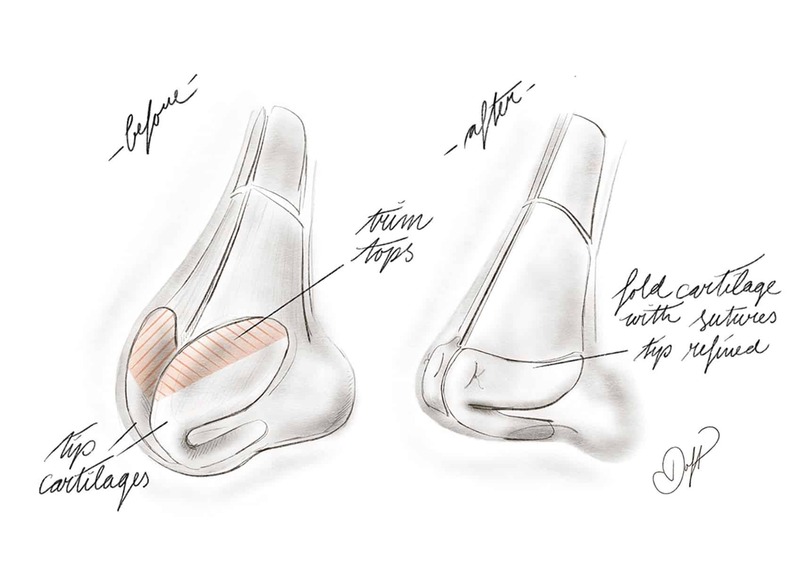 Direct vision allows for delicate tip refining procedures and placing cartilage grafts. 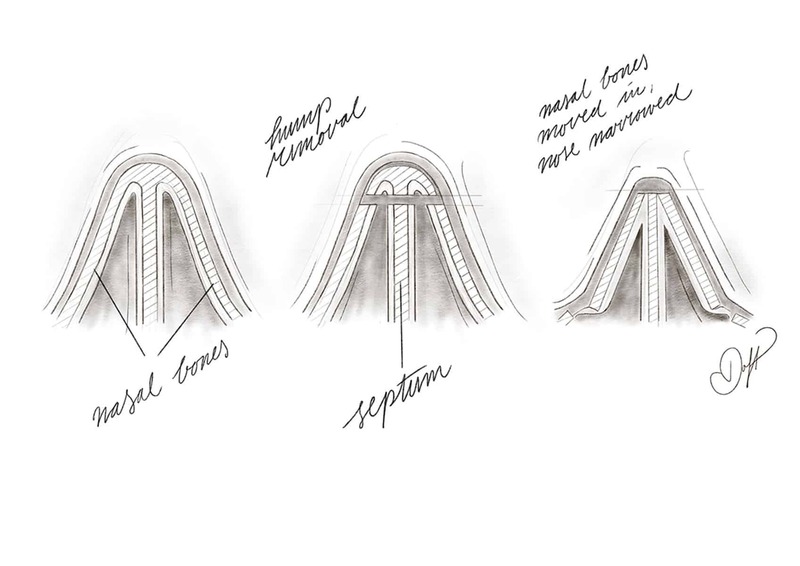 Many patients are afraid of having an external scar, but the scar is hidden in the narrowest part of the columella and it inconspicuous even in close conversation. The closed technique is useful for hump removal and minor tip modification. Through either incision, I will delicately re-sculpt the nasal bone and cartilage to help create a more balanced profile. Correction of a deviated septum as well as an alar resection, decreasing large nostrils, can also be performed during this procedure. Many patients present concerned with their profile. They are often focused on a large hump which affects how they style their hair and take photographs. The hump is secondary to large nasal bones, a high septum, and extra cartilage. The hump can be removed during surgery. When removed, it will leave a small space between the bones. This space is reduced by infracturing the nasal bones or moving the nasal bones closer to each other. Moving the bones closer together will reduce the width of your nose and establish a better-proportioned infrastructure. Many patients ask if their bones will need to be broken during their procedure. If the top of the nose is wide or if you have a significant hump, most likely the bones will need to be fractured. This often results in bruising under your eyes but is surprisingly not very painful. Many patients complain about a large hump or a wide nose. When the hump is removed during surgery, there is a small space between the bones. The nasal bones are fractured and moved closer together to both close the space and narrow the bridge of the nose. The nasal tip is the other area of the nose that concerns most patients. It is often wide, drooping, boxy, and out of proportion with the rest of the face. Most patients seek improved tip definition. By subtle changes in tip anatomy, the tip can rise, narrow, and become smaller. These changes are performed by removing unnecessary cartilage and employing tip-defining sutures. The lower part of the septum can also be removed to help elevate a drooping tip. Sometimes when I remove the lower part of the septum, I will use it to help strengthen the tip to prevent drooping further. The tip of the nose can appear boxy and unrefined. During surgery, the tip can be made smaller, narrower and higher but using sutures and removing unnecessary cartilage. Often an oversized nose appears larger due to a small chin. It is common for a patient to combine rhinoplasty with a chin augmentation, or placement of a chin implant. Chin implants are made of a solid piece of silicone and do not have to be changed in the future. A chin implant is placed through a small incision on the under-surface of your chin. It is essential that when contemplating nasal surgery, you consider all of your facial features creating balance and harmony between them. Adding a chin implant may make your nose appear less dominant. Neck liposuction is a procedure which many patients combine with rhinoplasty. Liposuction helps define your jawline and adds little time to the procedure. Should I try a liquid rhinoplasty instead? A liquid rhinoplasty refers to a non-surgical rhinoplasty in which dermal fillers are injected into your nose to help balance nasal proportions. A liquid rhinoplasty cannot make a very crooked nose perfectly straight as this non-surgical rhinoplasty is only camouflaging the features of your nose that make it appear crooked. It cannot lift the tip of your nose. By adding filler to the tip of your nose, you will be adding volume to an already droopy or sagging tip and thus exaggerating what you wish to hide. It cannot fix a breathing problem. Breathing problems are related to deviated septums or internal anatomic problems, not contour irregularities. Surgery is the only option to improve structural problems leading to breathing difficulties. If you are considering a rhinoplasty for functional or cosmetic reasons, please call our office at (212) 600-4109 to arrange for a consultation. Our New York City practice accommodates out of town and international patients who need to travel in for surgery as well as those who are local to Manhattan.